Writing a cookbook is hard. I lie awake at night wondering why my seolleontang didn’t turn white. I worry that my food tastes bad, or even worse, just mediocre. I plan grocery expeditions in three different boroughs and feel my shoulders ache just thinking of carrying the groceries home. And of course, there is the issue, or more accurately, issues of translating Korean ingredients into words that are understandable and available in English. For example, the question of scallions. The easiest way is to start with a picture: from left to right, a Korean daepa (대파), a leek, and a bunch of American scallions (also known as green onions, a whole separate issue for Part II of this post). Korean cooking primarily uses two kinds of young, long green vegetables belonging to the Allium genus that comprises onions, leeks, shallots, garlic and chives. The first, daepa, is about three-quarters to an inch thick and very long, so long I have to fold them in half to get them to fit inside my vegetable drawer. They are often used to make stock, but they are also often thrown into soups right before serving, adding a flavor that remains fresh and sharp. When used in this way, they are usually split in half lengthwise and then sliced thinly to create little half-moons of translucent green and white. In the U.S., I’ve only ever been able to find them in Korean and Japanese grocery stores, never anywhere else. Daepa is often translated in English-language Korean cookbooks as “leek.” That is not correct. It may be fair to call them “Korean leeks,” but it’s definitely misleading to imply they’re simply the same leeks Americans are used to seeing in their grocery stores. Yes, it belongs to the same family as leeks, and its size is closer to a leek than a scallion, but if you look closely, you can see that they are very different. 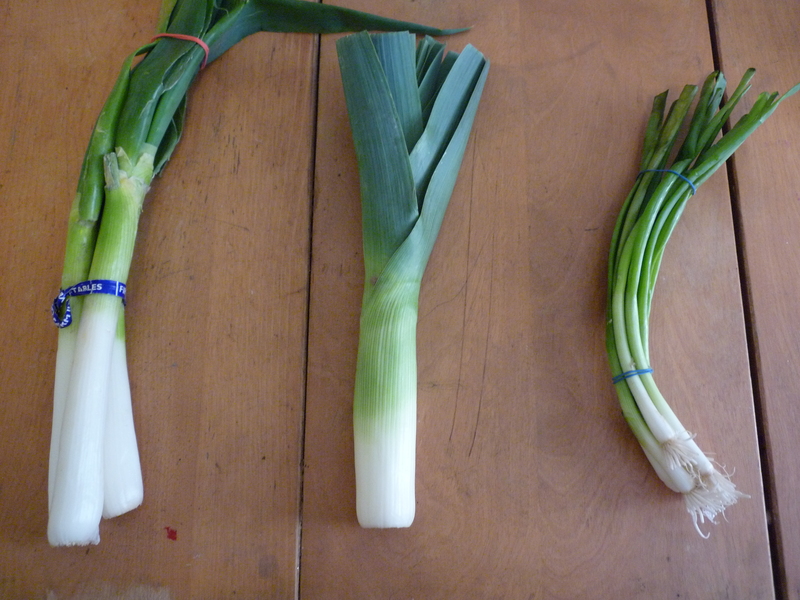 In the leek, the green stems grow out of the white base stiff and wide, like a fan. In daepa, the green stems are floppier and more flexible. 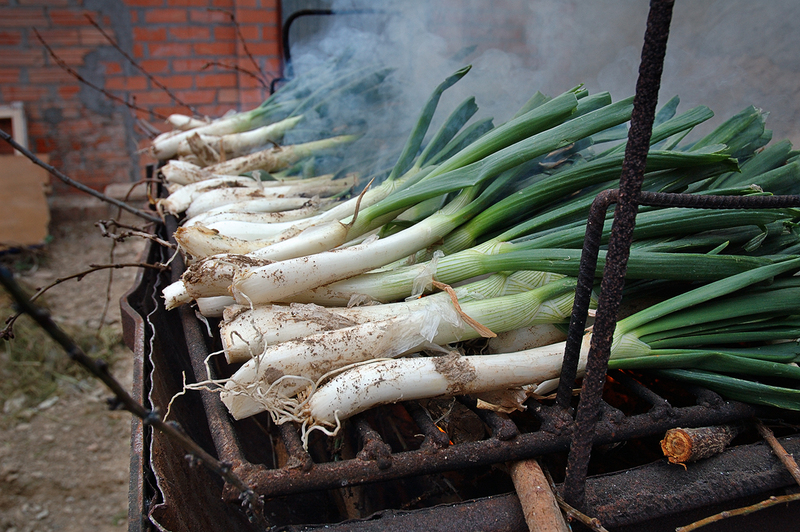 Judging by this photo, the Catalan calcot may be similar to daepa. It also may be accurate to call daepa a “welsh onion,” but I can’t say for sure because I’ve never seen a self-described welsh onion. In flavor, daepa and leek are noticeably different as well. When raw, a leek is mild and ever so faintly sweet. Daepa has more of a kick with a lingering even fainter sweetness. When cooked, the difference is even more noticeable. Leeks cook up almost creamy in their sweetness. Daepa sweetens as it cooks, like any onion, but it retains a sharper, more garlicky flavor. 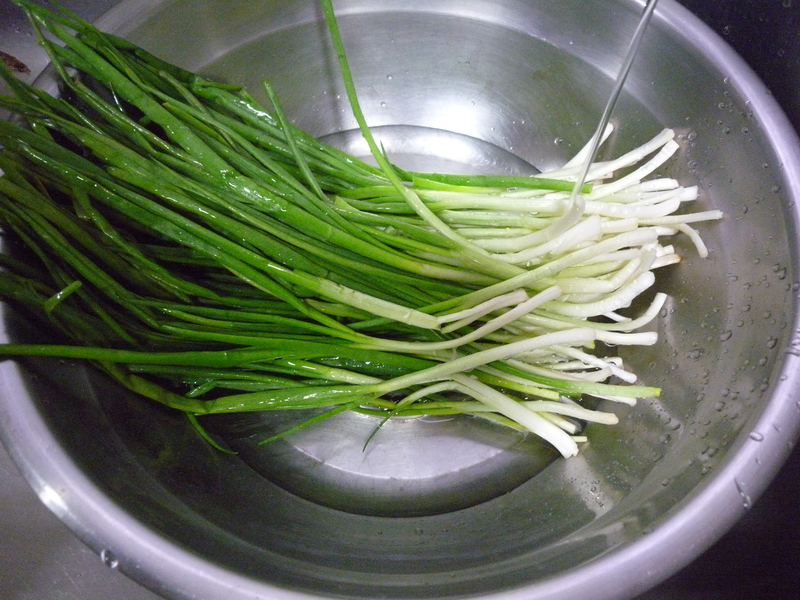 The second type of green onion commonly used in Korean cooking is shilpa, 실파, often called just pa, 파. This is the type of scallion that gets cooked into seafood-scallion pancakes, chopped and thrown into marinades for bulgogi and galbi, and thrown into all kinds of soups and stews, as well as many kimchis. Shilpa look a lot more like the scallions you can find in American grocery stores, but even they are not an exact match. Compare the photo at the top and the photo just above, of shilpa that my mom bought while I was in Korea. Korean shilpa are a little thinner and more delicate in both looks and in flavor. Still, they’re a close enough match that I feel comfortable using American scallions when Korean recipes call for shilpa. And here is where I make my stand as a cookbook author: I feel more comfortable using American scallions when Korean recipes call for daepa as well. I know, you’re all reeling in horror. But it’s true. If you make a Korean beef stock with a leek, you will end up a stock that’s noticeably too sweet. I know, I’ve tried. It’s true that American scallions don’t add quite the same flavor as daepa. But I find I can add just a little bit of extra sweetness with an onion, and I’m experimenting with whether it’s worth using a yellow onion rather than the white one more common in Korean cooking. So that seems easy, right? Buy a bunch of scallions and be done with it! But that doesn’t get to the question of how scallions should be described…Stay tuned for Part II. This entry was posted on March 8, 2010 at 11:20 pm and is filed under Home Cooking, Korean Food. You can follow any responses to this entry through the RSS 2.0 feed. You can leave a response, or trackback from your own site. You left out a key allium that makes one of my favorites, buchu! So true, that is a very important allium, but that’s almost another blog entry! I can’t seem to find a good substitute for Asian chives. Western chives definitely aren’t going to cut it. Eww western chives are gross. Glad to hear I’m not the only one using American scallions for pa and daepa! I bet it would be delicious! I’m jealous you’ve been to the calcot festival and that you’ve lived in Barcelona. What a beautiful city. Thanks for your kind words. Thank goodness someone clarified. I bought what were labeled as “pencil onions” at the grocery store the other day. This particular store specializes in more ethnic fare, especially the produce department, which caters mostly to Latin American cooks, but also has a healthy selection of Asian foods, as well. I found these onions beside the scallions and leeks (both of which I recognized) and decided to give them a shot. Yours is the first picture I have actually found of daepa; I’m just thrilled I now have a name for these things! I put them in a yogurt sauce with garlic, basil, salt, pepper and a touch of cream cheese which I used as a garnish on an eggplant and potato casserole (similar to moussaka, but with my own twist.) I also saved a few of the daepa for garnish. Those little things are packed with flavor and make a beautiful garnish!! Anyway, thank you for the article! Thanks, so glad it was useful! WOW! Thank you! I’ve spent the last week watching a woman on youtube make Korean dishes. She’s a woman in her, well, I’d say she’s between 50 and 65. She speaks Korean during her videos and the odd English word every now and then when saying what she’s using and she uses daepa in everything but says “One green onion” when saying it in English but green onions here in Australia are scallions which are called “Green onions” so I knew she was not using scallions and I could not find what I now know are called daepa. I kept thinking maybe she was using leeks but the green tips, as you explained are too different. Thanks to your post I now know they don’t sell them here unless in an Asian grocery store but i’m in a small town so we don’t get them at all. I know now to just use green onions aka scallions. You have helped me SO much. Thank you so much for this post! I want to make so many of her dishes but wasn’t able to because I could not find that big long green onion thing she uses hahaha. Now I can make all her dishes, but with scallions haha…THANK YOU!